Figure 1-3.Typical listing of an assembly. 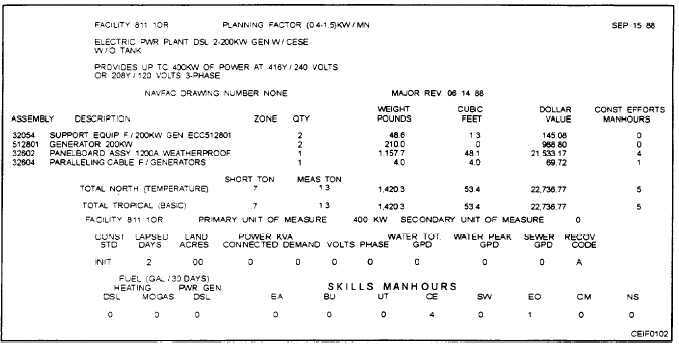 Home > Construction Training Manuals > Construction Electrician Intermediate > Figure 1-3.Typical Listing Of An Assembly. Figure 1-2. - Typical listing of a facility, facility 811 10R. Figure 1-3. - Typical listing of an assembly. climates plus the unique requirements for either tropical or northern areas. 1. Construction standards (const std) are grouped into two classifications: initial and temporary. a. INITIAL (INIT) - Duration of requirement less than 6 months. b. TEMPORARY (TEMP) - Duration of requirement from 6 to 60 months. 2. Days of construction duration (lapsed days) are based on job requirements, optimum construction crew size. and full-material availability. 3. Often the land requirements, in acres, based on the assumed plot plan, will not be followed exactly because of terrain or existing buildings. The idealized plot plan was developed to design sup- porting utility systems. The material contained in the utility facilities has been increased to allow for variation in terrain.